SHE HULK #1 In this image, I wanted to continue the humorous aspects of Dan's writing, so here we have She-Hulk as "Lady Justice". Of course, Justice is supposed to be blind, and she is peeking! 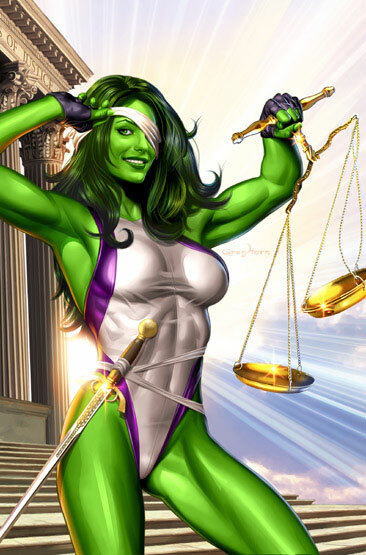 For those who don't know, She-Hulk's real job is a lawyer, and she is always using her super-abilities to her advantage in her cases (or else she is getting herself in trouble with the judge!). Anyway, I am signed on to do these covers indefinitely, so there should be a lot more big beautiful greeness in our near future!